Sea Bass is known for it’s great taste. You don’t have to do much to prepare a great fish dish. The fish is known as white fish, although that’s not a scientific group. It’s generally meant as a type of fish that has a mild flavour and is easy to prepare. A simple baked sea bass with a little pepper and salt is definitely good food. As a leading seafood supplier we export seabass fillets to wholesalers, retailers and stores in Europe. Our fillets are available in all sorts. As a seafood supplier we sell our sea bass fillets pin bone in, skin on and boneless. At our fish processing plant we can process the fish to whole round, battered, scaled, head on, headless, butterfly or gutted. How we call Sea Bass in different countries? The European seabass was one of the first types of fish to be farmed commercially in Europe. Our sea bass is also farmed in plants that are certified for best aquaculture practices, located in Greece and Turkey. Sea bass can be caught too, but almost everyone on the market prefers to farm it. The reason for this is that sea bass is really expensive and hard to catch because of its scarcity. We also have sea bass available from the North Sea next to the Netherlands, but we only use farmed sea bass in our fillets. The European seabass is regarded as one of the most important commercial fish in the Mediterranean. Sea bass is especially a really popular dish in Italy and Spain. Preparation can be quick and easy, and still have a great dinner tonight with excellent taste. In Northern Italy they use the name branzino or branzini for European sea bass, and in other parts of Italy it is called spigola or ragno. In Spain the fish is called lubina or róbalo. In Italian and Spanish cuisines sea bass is often prepared steamed, roasted, grilled, poached or braised whole. You can also prepare your sea bass in the oven, however when you do we recommend you to wrap the fish in foil so that the flesh does not dry out. The fillets are imported from Greece and Turkey to our fish processing factory in the Netherlands. After a quality control, inventory procedures they are being placed into storage. Fillets are processed and packed by customer needs. Short mention is that we are able to process products gluten free. After a last check the goods are ready for transport. You can expect on-time delivery with 100% traceability and transparency. Seabass fillets are available in the following sizes: 60-80 g / 80-100 g / 100-140 g / 140-180 g. Since sea bass is a very versatile fish, van der Lee took this into consideration and offers a large variety of sizes. Whole sea bass normally range from 1 to 2 pounds, but our fillets come in all sizes. They range from 1/3 oz to 7/9 oz of light, clean and delicate fillets. Seabass export to Europe, Asia etc. 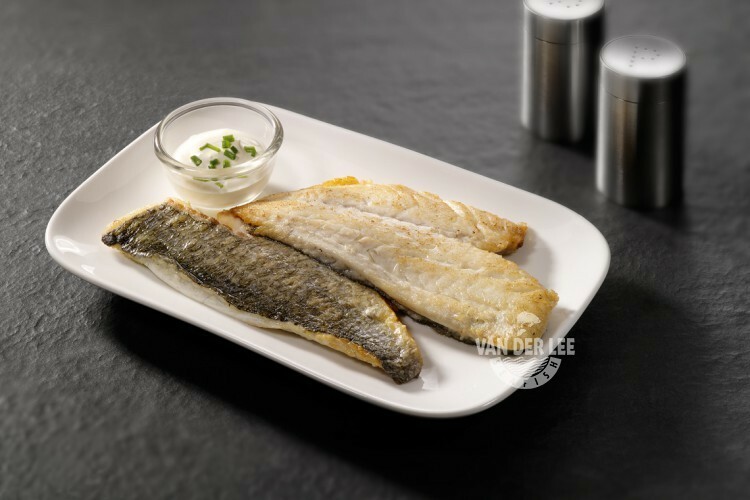 Van der Lee Seafish is a leading distributor of Sea Bass fillets worldwide. Our export of sea bass fillet goes particularly to restaurants, schools, nursing homes, prisons, importers, wholesalers and retailers in Italy, Spain, Germany and England.